Oh hello! Yes I'm the person that was just going to give away a skein of Malabrigo a few days after posting and BOOM it's a month later. Yes, well, that's par for course around here I'm afraid to to tell you. However I am rectifying the gross injustice that has been committed by sending it out straight away to the Greenhorn Knitter. Enjoy! I recently acquired a few skeins of Rowan Creative Focus Worsted in a series of events that went something like this: go to lys for something totally unrelated->chat with owner Cynthia (love her!) about Rowan->buy Rowan pattern mag "City Retreat"->get home and feverishly order four skeins (don't hate on me, her store doesn't carry it! )->twiddle thumbs/stare into the void waiting for yarn to arrive-> receive yarn but realize the Rowan hat pattern I'd wanted to do is knit flat (HATE THAT WHY DOES MARTIN STOREY DO THAT)->troll Ravelry for a better pattern and voilà-> Ripley! Ripley was quite a lot of fun once I got past the band. The pattern gives you the choice of either a picot/lace band or a garter st one. I chose the latter as it seems less fussy and femme, and I'm happy with this choice although next time I might just instead do a regular cast-on band as this took a tad longer than I'd like. 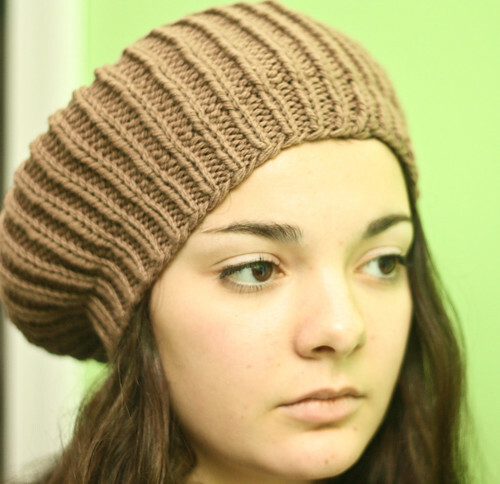 This is the first time I've ever done the "knitting pleats into the back of that hat" maneuver. Yeah, that! Such a nice built-in slouchy effect and bonus: you always know where the back of the hat is. Nice touch, Ysolda! To say that I was thrilled with this scene would be an understatement. After arranging my tiny pals just so (I knew I was collecting wee woodland wooden figurines for a reason), I basically went into a fugue state and stared at it (think: drooling) for a good 20 minutes. The kids were, oh how shall I put it, concerned for my mental health/mortified? "If you post that on Facebook I AM GOING TO DIE! ", I believe one of them said. Feh! Not sure which one because I was too enthralled with my special fantasy world of toadstools and tiny hedgehogs to really notice. 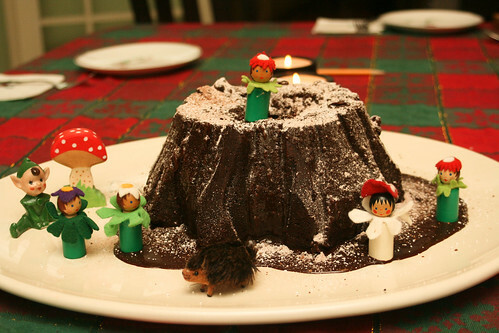 In any case, this was our stump de Noël cake. It's like a bûche, but it's a stump--get it? I consider myself quite lucky because just as my tempermental junior divas grow increasingly weary of my FO photo shoot requests and start to try to write riders into their contracts with me (iTunes gift cards & the Justin Bieber perfume in exchange for modeling a hat, are you kidding me? ), I have new talent rising up through the ranks. We had the good fortune of hosting the Ireland-Brooklyn-Moroccan contingent of our family for Thanksgiving which meant that the younger siblings of my daughters would be available for action. 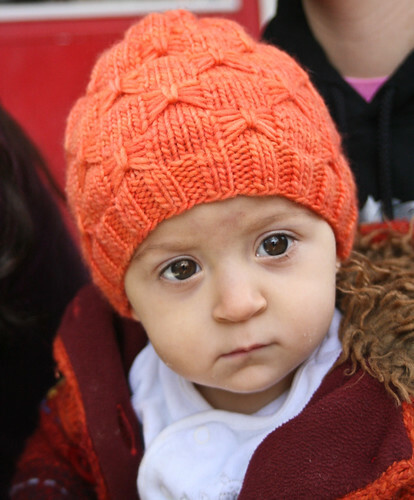 The older sister here is quite fond of the camera and the younger one can't speak yet, so no protest from her at all! 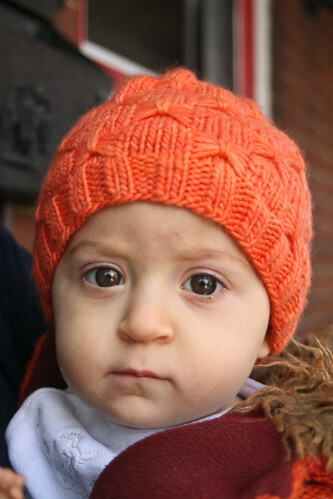 I originally made the orange hat for the big sister. 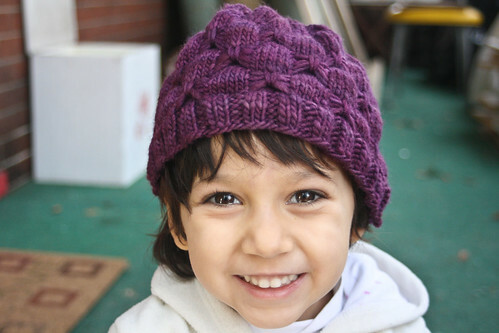 She quite craftily let me know that "...this hat is for the baby, MY HAT is purple". I mean, how can I refuse a sly request like that? You better believe I was off like a shot to rifle through my stash to find the perfect color. The older sister noticed the butterfly motif right away and exclaimed "Féileacán!" (fail-uh-con-- butterfly in Irish) in her excitement. 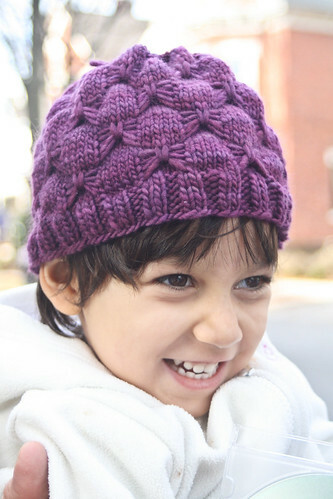 The butterfly stitch is gimmicky for sure, and it's definitely a one-trick pony typa deal, but for kids it's a super cute idea, right? Malabrigo is a dream...for certain projects. I would never be so foolish as to knit a sweater out of it, it's an accessories only affair in my opinion as the pill factor is a little out of control. But the colors, the colors! Honestly they are quite unreal. I used to wax poetic over Frank Ochre and Bobby Blue, but this Tiger Lily is pretty dazzling. What's your favorite shade? Let me know in the comments and I'll set up a mini Tombola. I'm going to the post office on the last day of November, so leave your comment by then and you might be a winner! Seeing as I seem to be acquiring "special order" yarn like it's my job, I figured it was time to actually knit with the stuff. What good is stoking an Internet yarn sensation if you don't actually knit with it? I had the perfect pattern ready to go, so I made myself a cocktail (unrelated), got out my X-acto knife and tore into my box of shiny new yarn. Hot tip: don't use X-acto knives around boxes of yarn unless splicing and dicing is your game. Yarn carnage aside, all I can say is I was so pleased with the Internet super shopper me that had ordered the assorted Quince and co. yarn ten days previously because WOW. Soft. Colors for days. Gorgeous hand. Swoon. 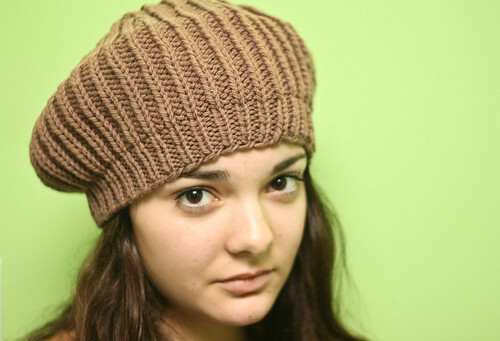 I love the ribbing action on this hat. Cute! Classy! (Just kidding, I hate that word). The shaping is perfection and the knitting couldn't be more pleasingly mindless. I am so happy with how this hat turned out. And the yarn is so unbelievably plush. I strongly urge you to fondle it soon. This hat is a long overdue donation to a local charity. Over a year ago I became inspired (first warning sign) to donate a knitted hat to a charity auction (they should have run screaming) A very nice lady had the misfortune to bid on my hat THINKING she was getting a wooly garment that would keep her warm during a blisteringly cold winter. BWAHAHAHAHA! Oops. Somehow this one got away from me and the guilt started to fester. But now it's done, so...there's that? In any case, I should not be permitted to ever volunteer my knitting services for any charity function whatsoever. 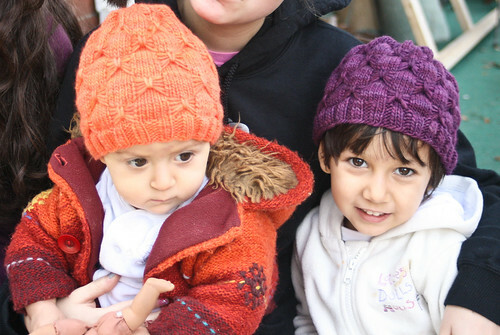 If you are soliciting knitted donations for your (probably) worthy cause, please don't ask me to knit for you unless you want to engender Bad Feelings toward you and your organization. Just go ahead and mark me down in the "will make a small token cash donation" column permanently for life. Thanks! Of one of the pure joys of fall is being able to fire up the hat assembly line and crank out hats in pure Fordist fashion. 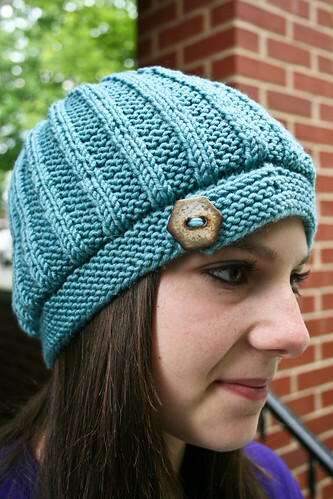 Nothing is more exciting to this knitter than making hats. Sweaters are fine and dandy but oh when you have a lot of real estate to cover they're decidedly less exciting--can I get an amen from the XLs among you? Scarves start with a bang and invariably lost their luster when it's clear you're in it for the long haul. Mittens and socks are fun and games until you have to replicate the whole thing--suddenly not so fun! 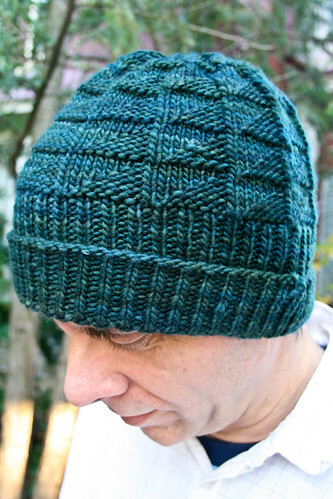 But the hat is a perfect project, from start to finish. No time to fizzle out, you are just going great guns from start to finish. Modifications: None except accidentally doing slightly more on the brim that was called for in the pattern. Oops! I have pure, unbridled enthusiasm for this pattern. Is saw Kristen post it on Flickr and was immediately hot to trot for it. I shamelessly asked when the pattern would be ready because I was dying to make it and luck would have it, it was ready earlier than expected. I am leading such a charmed life. 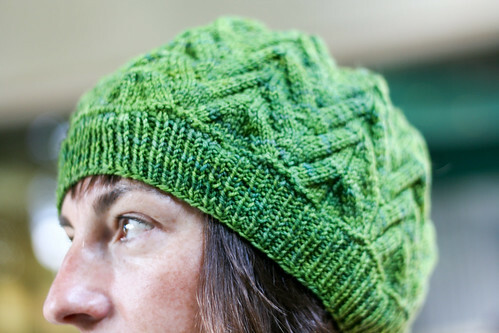 The pattern is loads of fun because it's composed of the semaphore stitch which keeps a potential stockinette snoozefest interesting and visually appealing. The Malabrigo knit-up on a 7 gives such a nice, tight gauge. This hat is going to be a warm one, folks. 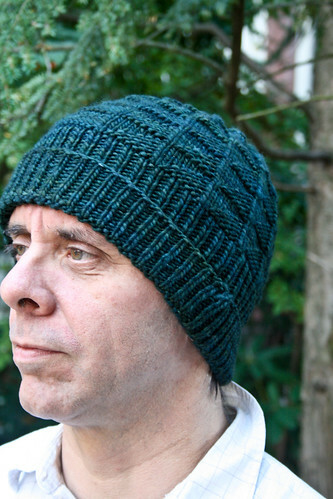 I have dubbed my particular version of this hat Horatio Hornbobber to fit the individual you see pictured here. Similar to the Little Girl with a Curl, when he is good he is very, very good but when he is bad, he is...a hornbobber! This is term that we have invented amongst ourselves and are trying to have gain traction and become a term for general usage. To hornbob is to ceaselessly complain, belly ache and generally grouse about insignificant details that one has inevitably blown out of proportion. It is a behavior that does not endear the hornbobber to those around him. The individual you see pictured here is the person most likely to hornbob in our household, hence the masculine pronoun in the previous sentence. This photo shoot was done post-hornbobbing fit, the topic of which I honestly can't recall, but it is likely that the complaints involved the number of lip balms owned by your truly, the mounting number of yogurts in the fridge and their impending expiration dates of doom, or some other matter of great import. I'm sure you might know a few hornbobbers, please do not hesitate to categorize them as such and let them know of their horrid hornbobbing ways. Hornbobbing will only be tolerated in small amounts! Excuse me whileI brush that dust off my shoulder à la Jay-Z while I tell you all about the latest roll I'm on. PEOPLE--I'm on a roll because for the second time in the last five years Nora has asked me to knit her something that she actually wore and did not throw down in disgust or pile it on her Poang which is a repository for all her crumpled, discarded garments!! I am such a winner right now. Mods: I only cast on 112 sts as I had a long-tail cast-on dysfunctional moment and couldn’t imagine casting it on all over again. So the cowl is not quite as epic as it could’ve been but it’s still long enough to loop around her neck a few times. 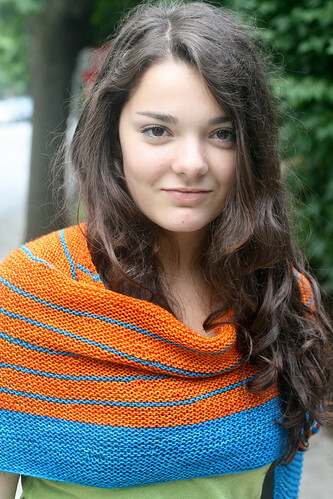 Nora approached me several weeks ago and indicated her desire for a colorful long neck wrap. We perused Ravelry and alighted upon this pattern. Now I have no illusions that the fact the the Gap is named-checked in the pattern didn't have something to do with her enthusiasm. That little touch of branding helped immensely in our decision, and she chose this pattern. Thank you corporate America for colonizing the minds of our youth and lending your imprimatur of authenticity to this pattern! 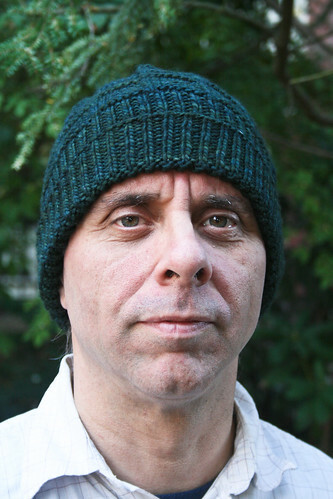 The pattern is modeled after a well-known Gap cowl that the author saw and like any self-respecting knitter thought There is no way I'm paying for that. I could knit that up in a heartbeat. And she did! Thanks Jen, because I am just lame enough that had I been with my daughter in Satan's Lair i.e. the mall, I would've been the loser knitter that lazily shelled out the cash for it. My self-respect thanks you! Next-up for me: a finished Rhinebeck sweater. I KNOW!! Normally I like to keep it light up in here, but today I have a serious question of a deep philosophical nature: can a shawl really be called an Ishbel if the slatternly knitter behind it only does one repeat of chart A? Yes, I said one repeat of chart A. I'm not quite sure what caused me to bind off and call it a day at that point. Was is that I was seeing the recipient of the shawl (if you can call it that) later that afternoon and wanted desperately to give it to her? Was it my utter and total DONENESS with shawls for the time being? Maybe it was in fact my eagerness to get on with my Rhinebeck sweater(s). Not sure, in any case: one repeat of chart A. 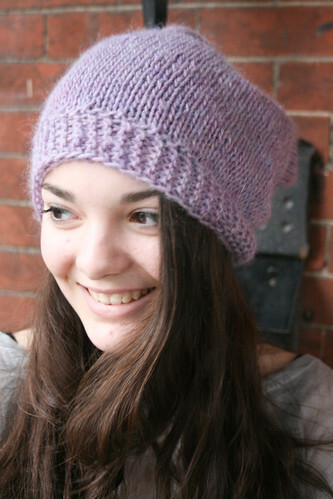 Pattern: Ishbel by Ysolda Teague. Yarn: one skein of madelinetosh sock in 'Tart'. Needles: size 6 Kollage Square needles w/ the hard cable. Size: Cast on for size large. Mods: One repeat of chart A. This has epic WIN or epic FAIL written all over it, depending on your point of view. One of the reasons I was eager to give this project to my lovely pal J was that she is one of my only not-currently-knitting* friends who reads my blog and made a very sweet request after seeing the Striped Study shawl. 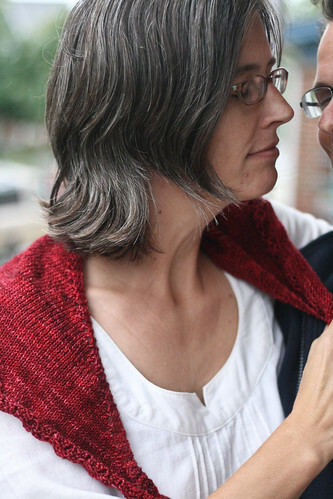 "Heather...I would be willing to pay you for that shawl on your blog...that red...oh my". As you all know, a. we knitters all live for such requests and b. we knitters would never accept money from a good friend for a piece of our handiwork. Sadly her request came two days too late as I had already given it to Sandrine. Ah non! 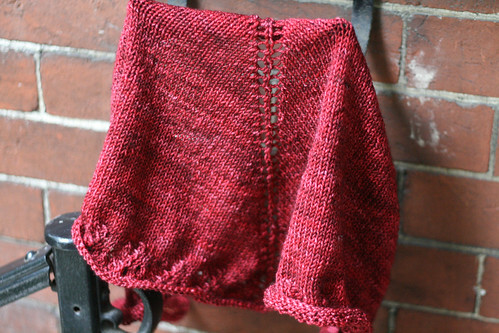 So instead I decided to cut to the chase and knit her a shawl out of strictly Tart. And even though it's quite small, I'm hoping it can be a mighty fine neck warmer. I am fully expecting to receive a cease and desist letter at any moment from Ysolda's solicitors (oh là très British), demanding that I refrain from continuing to call this pattern Ishbel. Fair enough! *in point of fact J IS a knitter but she happens to have a MIL who is a superior plus expert knitter that could completely blow doors of Meg Swansen, Barbara Walker and any recipient of the TNNA Master Knitter title combined with her eyes closed and one arm tied behind her back. Kinda doesn't leave a lot of room for someone who is merely outstanding, does it? 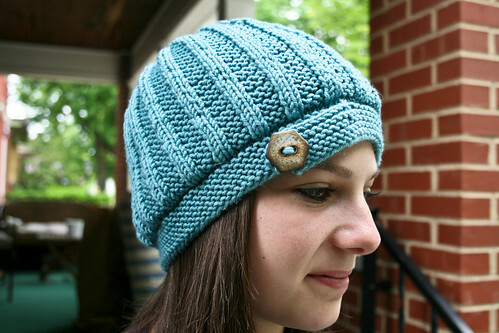 I never cease to marvel at the incredible talents of our knitpal designers. We are so fortunate to be surrounded by a cohort of super talented designers that seems to effortlessly churn out patterns that keep us interested and knee-deep in fabulous knits. 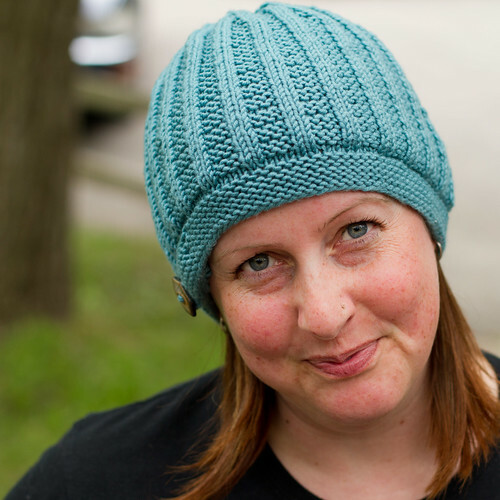 One of those designers, Melissa of Knitting School Dropout fame, just won't quit with the amazing. 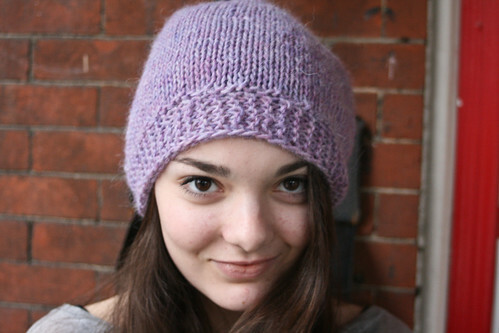 Case in point: the Cecily Beret. 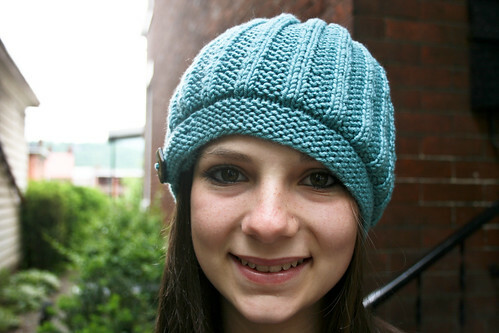 Pattern: Cecily Beret by Knitting School Dropout. Yarn: Dream in Color Smooshy, 'Happy Forest', .75 a skein. Needles: 1 and 2.5 16 mm addi turbos. This pattern was the type of affair that the more intrepid among us could whip up in a few days. I chose to do mine slow boat to China style and It has been ages since I've knit something at such a fine gauge. Far too long! This was a pure joy from start to finish, so I strongly recommend you give it a whirl. Things you most likely know about me by now: when I promise you phenomena such as a cavalcade of knits, you that this likely means you won't see hide nor hair of me for a month. Oops! Hey, it's hard work having both your kids at camp--suddenly finding oneself with deep existential choices such as Shall I have a Moscow Mule or a Dark n Stormy for dinner? Which buttermilk-based Smitten Kitchen recipe shall I make next? And--now this last one is knitting related--Would Button Jar or Longjohns be the most appealing choice for my Rhinebeck sweater? Why your day can get eaten right up by such preoccupations! Needles: Size 6 Kollage Square Firm Cable, because the Soft Cable ones swim with the fishes, if you know what I mean. Mods: I did three extra stripes, partly because I fancied a longer shawl than the ones I'd seen, but mainly because I knew a 1/6 of a skein of 'Citric' would be of little use to me and thus ragemaking. Glad I did, it is indeed the perfect size. Now there is no doubt in my mind that when you read the whiny grousing on my part w/r/t/ the Stripe Study Shawl, the whole waah-it's taking-a-long-time-and-giving-me-knitting-zombie-brain folderol, you knew beyond a shadow of a doubt that I was in all likelihood moments away from casting on for another VV pattern and signing up for another tour of duty in garter stitch/short row boot camp. And you were so right. You know me better than I know myself! I really strongly recommend this pattern. The shape is quite different from the Stripe-Study as when all is said and done you end with a garment that is quite a pleasingly odd shape. I can well imagine this will do double duty as a shawl and a scarfy thing. You see here that the stars converged and the universe aligned to allow me to have two of my three models in the same place at the same time [kids do eventually return from camp, thankfully, and jolt you back into a life of slightly less indulgence]. How could I not take advantage of such a fortuitous event? 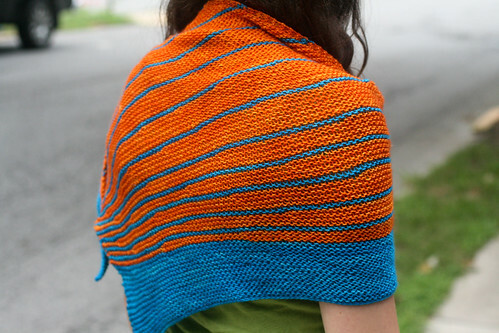 You can see from the picture that the shawl is quite expansive and can easily accommodate both. I had been dying to put together these colors--this particular shade of blue with this very shade of orange--forever. Very hup hup Holland, don't you agree? Another thing about me? I am a lover of all things Dutch: Double Dutch Bus, Dutch Wonderland, Pass the Dutch(ie), Dutch Bulbs, Dutch Wooden Sneakers from Holland....but come to think of it, not Dutch Treat so much and I am definitely glad I never had a Dutch Uncle. So, yeah. Isn't this the part of the post when I promise you the moon about FOs coming down the pike? Hmmm...maybe a litle Dutch Rock instead? 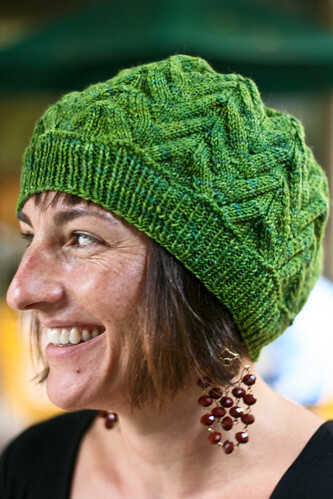 Those of you who are in the know and keep up with all the goings on in Knitlandia know the above picture to be of Caro, the beauty and brains behind Splityarn and Knitting it Old School. Can you even stand how cute she is, both here and in general? I haven't had a model round these parts of such stature in quite a long time. Let's not share that tidbit with my kids, because they are just looking for an escape clause in their contract and a way to get off this blog as soon as possible. But, come to think of it, child laborers don't even HAVE contracts, so pfft! 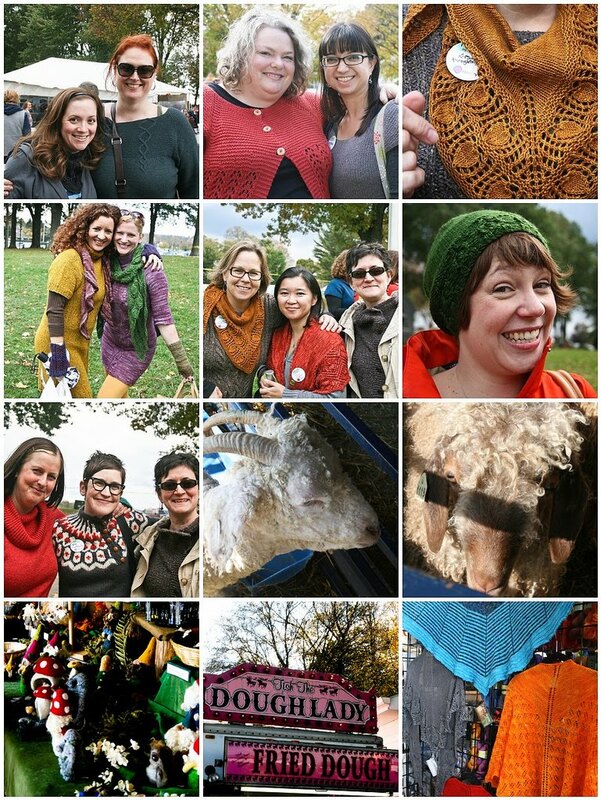 About a month or so ago, a group of friends gathered in the wilds of Michigan to have a lost weekend of bacon, fizzy lifting drinks and knitting. Sadly yours truly was in France, so I wasn't able to make it. Yes I was crestfallen, but I had duties to attend to that involved hot, fresh croissants, shepherding students around Paris, and watching hours and hours of DSK analysis on late-night talk shows. Luckily I was still able to participate in the hat swap that these knitpals had organized. I had the great fortune of being able to knit for Caro (although each and every one of these ladies has her own special charms). After my initial excitement suddenly it started to sink in: hello, you are knitting for a published knit author and all-around extremely skilled crafter. PRESSURE MUCH? Luckily for me, the hat turned out reasonably well. These things can go one of two ways: either the recipient truly likes what you've knitted her or she does an extremely good snow job and graciously makes you feel that she liked it. In this case, I do believe it was the former--whew! Yarn: Sublime Cashmere Merino Silk Aran in #137, two skeins. When I set out to find a pattern for my partner, I had some very specific criteria. 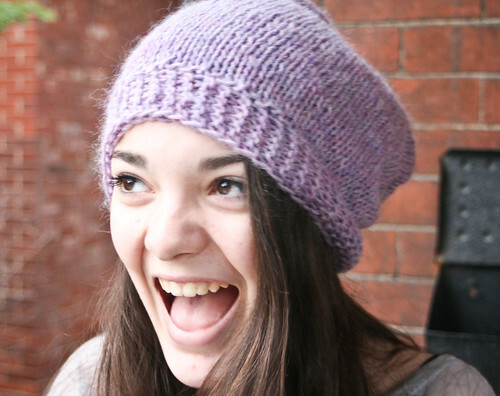 I knew I wanted to make cloche as this is the recipient's favorite hat shape. Check! 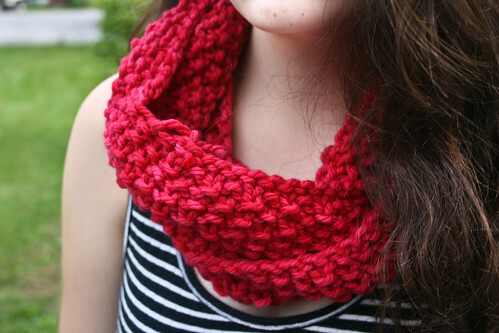 I wanted the pattern to have a special detail and maybe a fun stitch pattern? Check! I wanted to find a color to accentuate the otherworldliness of Caro's mesmerizing eyes. Check! And lastly, I wanted the pattern to have a name that signified Caro's country of origin. Check! Ok, just kidding about that last one. But Maple Leaf! Caro's Canadian! Get it? Kismet, pure kismet I tell you. This was such a pleasant pattern to make because of the the clarity of the directions and the general versatility of the pattern. 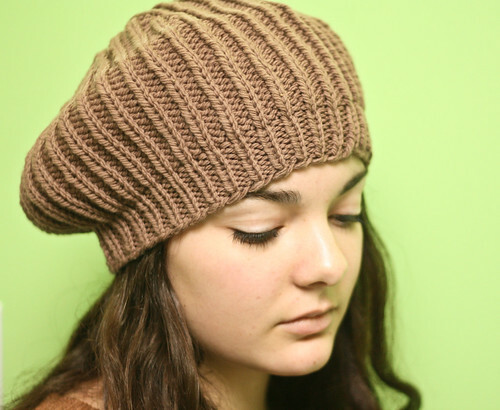 Directions are given for both a cloche and a slouch version. You will see that on Peeper (seen above and below) the hat is much larger, and if you squint and mentally photoshop your face on to her picture, you start to get an idea of what the slouch version might look like on you. Cute, right?